“Facheiro”, vernacular name of the genus, designating several different columnar species in Brazil, including Arrojadoa and Pilosocereus. A genus of shrubby or treelike plants, densely branched, having a short trunk, with cylindrical ascending stems. Ribs numerous (12-25), low and narrow, areoles close-set. Spines variable, aciculate. Lateral cephalium on reproductive adult branches (except in F. squamosa, without cephalium, which had justified the creation of the genus Zehntnerella), where the flowers are borne . Flowers nocturnal, self-sterile, tubular, with a short floral tube having overlapping scales and often covered with hairs, pinkish white to greenish white, pink to red, pollinated by bats and sphingideae (Rauh 1958, Backeberg 1966, in Emerson 2007). Fruits globose, translucent, fleshy, with juicy pulp, indehiscent. Seeds tuberculate to almost smooth according to species, covered with mucilage. Chiropterophilous dispersal (by bats). The genus Facheiroa grows endemically in the mountains of northern Brazil, from 370 m up to more than 1000 m in altitude, on limestone rock formations (Bambui formation) also named ≪dog teeth≫ (F. estevesii), on steep cliffs, in the catinga, a spiny shrubby typical vegetation, sometimes dense, and constituting the dominant of the landscape. 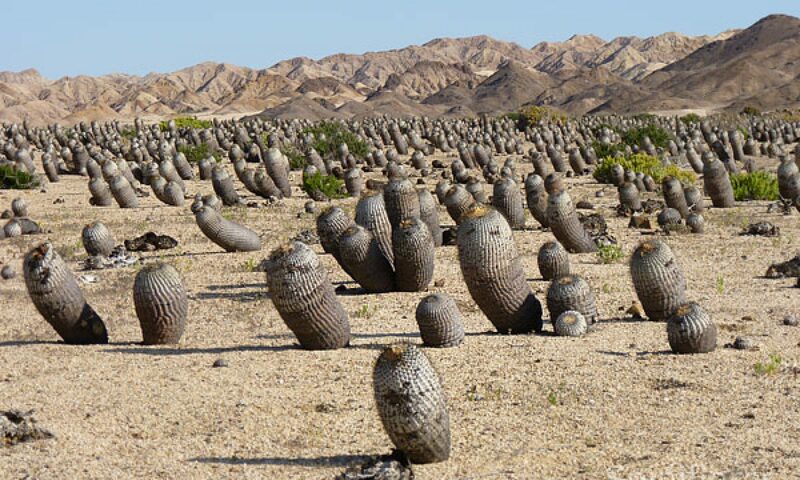 It is found together with many other cacti: Melocactus, Pilosocereus, Quiabentia, Tacinga etc. A very useful resource. I am the editor of the Central Oklahoma Cactus and Succulent Society (Oklahomacactus.com) and I often write about different cacti genera. 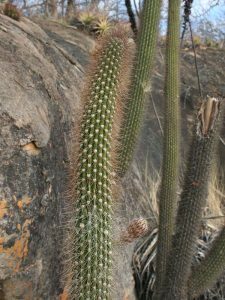 I participated in a cactus tour of North Eastern Brazil in 2009 an saw many nice habitats and cacti.